Next to our hotel was the Museum of Chincoteague, a small but perfectly satisfying museum that collects and preserves, as its website explains “the material culture that reflects the historical progression of the life on Chincoteague Island.” It was extra fun for us because we decided to participate in their scavenger hunt (which requires that you find the 30ish museum objects on a list that they give you). It was probably developed to keep children occupied and both Mr. History Tourist and I … what’s the word .. sucked at it. 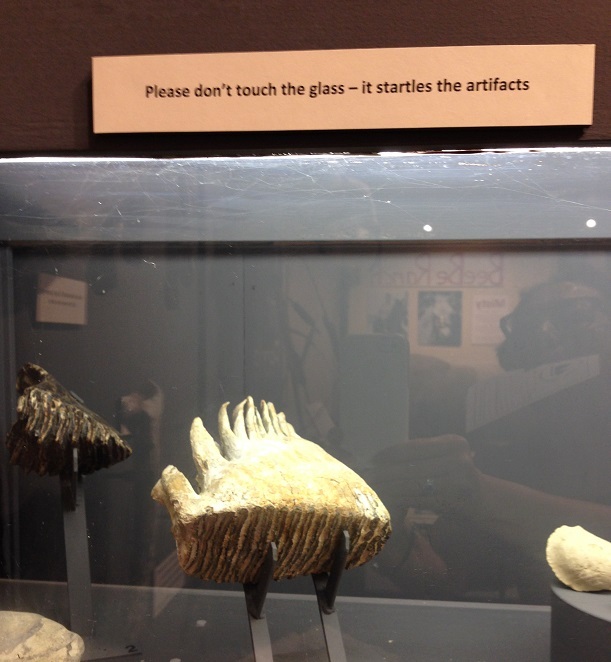 After about two hours (in a museum that would normally take us 45 minutes to get through), the museum receptionist pointed us toward the wall where the last object of our hunt lived. I think she was afraid we’d keep her at work well into the night with our pathetic observation skills. 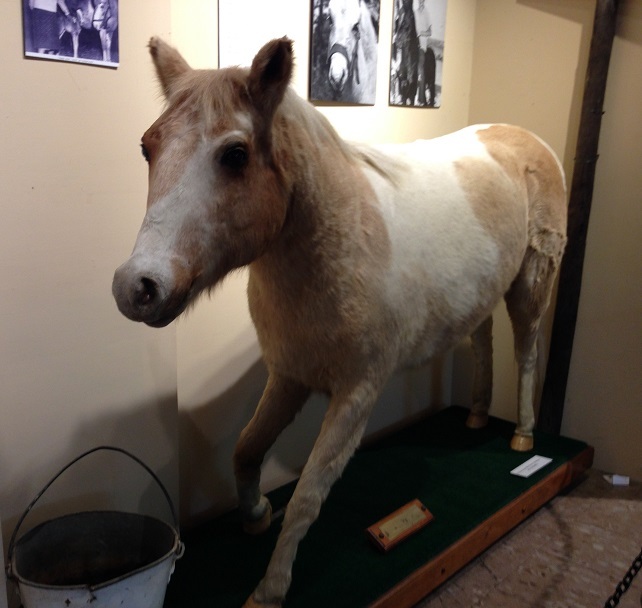 A surprise at the museum: on display was the taxidermied body of Misty of Chincoteague . That’s probably why the ponies of Chincoteague didn’t show themselves to us: fear of ending up like Misty. The Chincoteague Pony is a small (because of their nutrition-poor environment), feral horse who lives on Assateague Island. The story of Chincoteague ponies became fairly well-known in the States because of a 1947 children’s book (and subsequent film) called Misty of Chincoteague, about a pair of orphans who get a feral foal from an auction at Chincoteague. The book’s Misty was based on a real Misty, who was a Chincoteague pony, but was born to domesticated parents. Real Misty belonged to the author of the book and, while born on a farm on Chincoteague, lived most of her life on the author’s farm in Illinois. 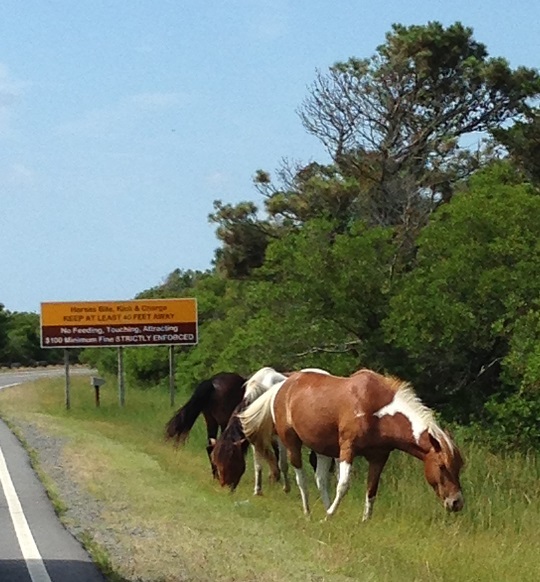 Assateague Island straddles Virginia and Maryland, with about 150 ponies living on each side. The ones on the Maryland side are owned by the National Park Service, are treated as wild and get no services from the NPS, other than contraceptives to prevent over-population. The ones on the Virginia side are owned by the Chincoteague Volunteer Fire Department and get veterinary services twice a year. It’s not altruism on the fire department’s part. It’s to ensure that they’re healthy if they end up as domesticated horses. Because since 1924, the Virginia ponies are rounded up, once a year, for a swim from Assateague Island to Chincoteague Island. There, the foals are auctioned to benefit the volunteer fire department. Misty in the book was one of those foals. I admit that I’ve never read the book nor seen the movie. But I’d lived in the Virginia/Maryland/DC area for most of my life, and the pony swim is featured on the news ever year. Which is why I knew about and wanted to see the ponies (though not the swim, which I find unsettling). I find some satisfaction in knowing that “buyers” sometimes bid only to give money to the fire department, and allow the foal to return to their lives on Assateague. Our hunt for Chincoteague ponies led us, on the second day of our trip, to the northern, Maryland entrance of the Assataegue Island National Seashore, about an hour away from the southern entrance where we were staying. There, as soon as we entered the park, we saw the ponies. Granted, grazing along the roadside isn’t as picturesque as romping on the beach, but we took what we could get. The sign behind the ponies says: “Horses bite, kick & charge. Keep at least 40 feet away. No feeding, touching, attracting. $100 minimum fine strictly enforced.” Of course, there are tourists who simply can’t resist approaching the horses, and who have been bitten, kicked and charged. We were not that type of tourist, however, and satisfied with the sighting, we spent the rest of the day in Berlin, Maryland, a late 18th century village. It was named, this year, by House Beautiful as the most beautiful town in Maryland. Perhaps, being a house magazine, they were judging the historic residential district. 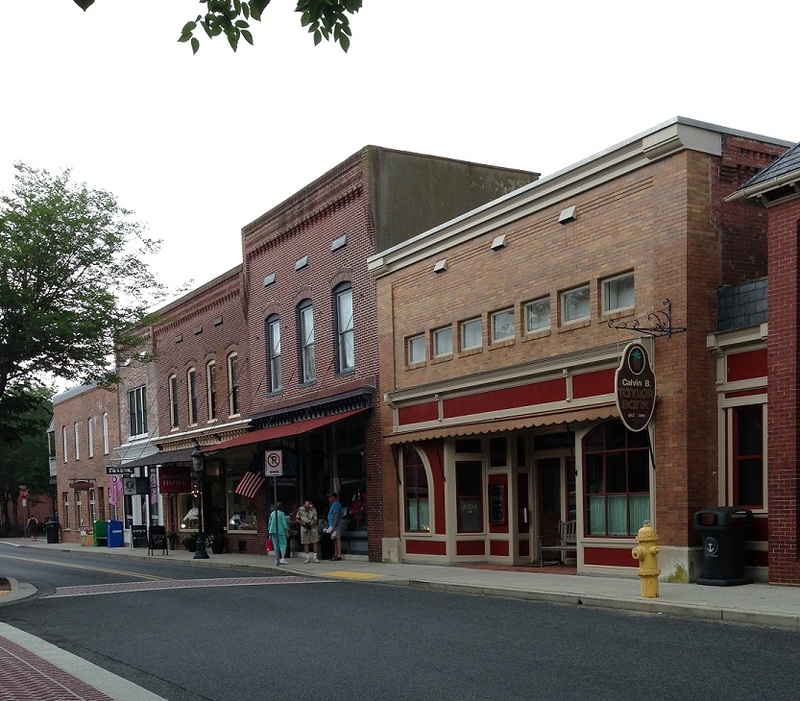 We were in the center of the commercial historic district and while perfectly charming and lovely, I’d say that there’s many other Maryland towns (Ellicott City, Chestertown, and Annapolis to start the list) that are equally charming and lovely. We had lunch and did some shopping before heading back to Chincoteague. Have you ever seen the film Runaway Bride? Or Tucker Everlasting? Both were filmed in Berlin. I haven’t seen either but now that I’ve been there, I’ll have to put both on my Netflix list. We stayed at the Best Western on Chincoteague Island — the closest motel (it had outside entry to the rooms) to the southern, Virginia entrance to Assateague Island. Chincoteague is small and any where on the island would probably be convenient. But I liked the Best Western for its location, clean and nicely-sized rooms, efficient and friendly staff, and reasonable price. looks a fabulous place. The ponies reminded me of those in Iceland. It is a bit pricey but worth it! I did see RUNAWAY BRIDE years ago, but I don’t recall any of it other than I enjoyed watching it at the time. I didn’t know about these wild horses, either. What an interesting project between Maryland and Virginia. I, too, like the idea of bidding on a favorite colt just to donate to the Fire Department. It makes me wonder how many people do the donation thing. I’ll have to look that up.